Welcome to the Bicycle Work Shop web-site. Our mission is to introduce you to the healthy and enjoyable sport of recumbent cycling and to provide recumbent buyers with exceptional service and the best possible choices in recumbent bikes and accessories. Recumbents are a pleasure to ride. You sit slightly reclined, back fully-supported, arms relaxed, neck straight; in a normal sitting position. Compare this with the contorted riding position on a diamond frame bike. Even after a long day of touring, you're still riding in comfort. No more stiff neck, aching back, numb hands or crotch. No straining either. A combination of lower mountain bike gears with higher road bike ranges ensures the correct gear ratio for any terrain. At the Bicycle Work Shop you can choose from recumbent bikes, trikes and tandems. Compared with old-fashioned bicycles, recumbent offer comfortable seating positions cut wind resistance by up to 30%. Since as much as 80% of a cyclist's energy goes to overcome air drag, the low seating position coupled with an aerodynamic fairing means you can travel faster and farther on a recumbent with less fatigue. The low center of gravity and longer wheel base yield unmatched stability. Without straining your neck you have a sweeping view of the road ahead. In an emergency there's no flying over handlebars. When stopped both feet easily reach the pavement. Passing motorists are more likely to notice your moving helmet than a bent-over back and its easier for cyclist and motorist to make eye-to-eye contact. 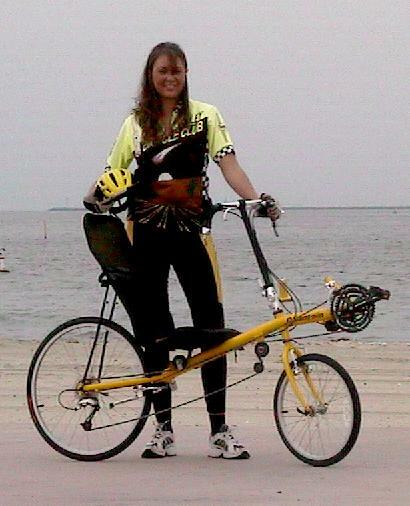 Your recumbent is definitely different,and different definitely gets noticed!